For over a month now, Tristen has refused to go out in the back yard after dark. Our laundry room is not attached to the house, so you have to go out the back door and across the back patio to get to it. Tristen will not go out there; not for laundry, not to take the dogs out, nothing will get him to do it. Why you may ask? He says there are hundreds of rats living in our back lot, climbing our trees, and taking over one of the abandoned out buildings. He is terrified of them. We've all explained that if there were hundreds of rats out there that we'd surely know it, rats don't climb trees of sit on fencing wire, and there is nothing to be afraid of. It has done no good. Our adopted grandma Marge has even tried to talk to him about it, but he won't listen to her. He's a smart kid. 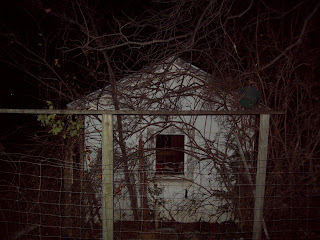 You see, our house sits on over an acre of property, we are our own city block. There are numerous out buildings on the lot, not to mention the three car garage, storage area, laundry room, green house combo building that sits closest to the actual house. The house was unoccupied for over 8 years before we moved in. I say unoccupied, it had tenants alright, all sorts of vermin lived here. I honestly never thought we'd get it clean enough to live her comfortably. But, we did and it's coming along quite nicely. And since moving here, we've only had a few mouse problems here and there, but Annabelle and Cookie keep that pretty much under control. I don't know why I'd never given any thought to wear all the rodents who'd lived in the house had relocated to. I guess I just thought they'd left. Wrong. 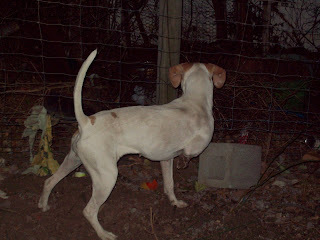 The following pics show our English Pointer, Shelby and our lab mix Dixie. 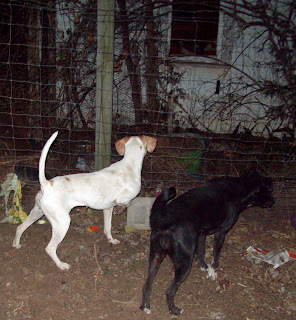 Dan let them out to romp for awhile and was so startled by what he saw that he called me outside. This pointing thing was not a good sign. You see, Dan had caught a glimpse of what we now believe to be roof rats, lots of them, sitting in the grape vines that surround our back fence. As you can see, Shelby saw them too. I promise this dog is normally white and there are normally not scraps of trash all around the yard. The wind was really bad the past few days and the yard's a mess. Anyway, here is the building that seems to be one of the rodent apartment complexes. Shelby & Dixie found the building very interesting. 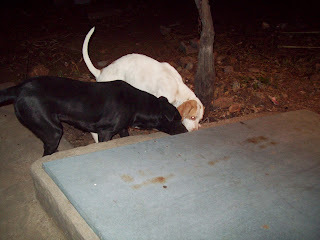 In fact they found a lot of interesting stuff in and around the back yard tonight. This really made me feel good about EVER going down into the cellar. So, yes rats do climb trees and yes you can have a bunch of them out in your field and not have a clue. I have a load of laundry in the dryer that will just have to stay there until daylight. And we already apologized to Tristen and told him parents are sometimes wrong...very rarely, but sometimes. Dan is amused that I'm blogging about roof rats, but hey it's not like we invited them here. And honestly, the whole thing was sort of funny. Apparently they love all this grown up foliage and underbrush and vacant buildings and all the other fun rat friendly stuff this lovely lot features. I wonder how much it's going to cost to clear out all this overgrown brush and stuff? I don't know what to do until we can afford a bull dozer, or bob cat, or whatever does that sort of thing. Do we poison them? Bring in more cats? I don't know what the answer is. But, I'm sure I am not going outside in the dark alone anytime soon. but you think dh could bring the front loader from work and clear the area some?